Hoytgasm! 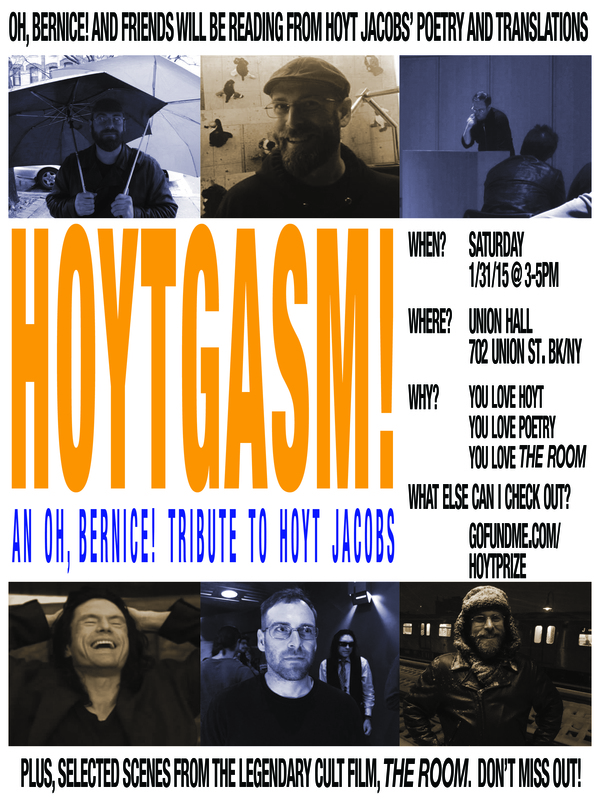 A Literary Tribute To Hoyt Jacobs (With Selected Scenes From THE ROOM) – Oh, Bernice! As you may well know, Bernice lost one of our own this month. Hoyt Jacobs passed away suddenly in a traffic accident in LIC. And because too many of our conversations about Hoyt have been about death, we want to commemorate his life. Therefore, we’re celebrating Hoyt Jacobs as he was: a poet, a translator, a lover of pop culture and carbohydrates—a vibrant, irreverent spirit. Reading from Hoyt Jacobs’ unpublished manuscripts of poetry and translation. Having an open mic, where anyone can speak about Hoyt Jacobs, or share work in memoriam. Performing selected scenes from one of Hoyt’s favorite films, legendary cult classic, The Room. Plus, Jason Fischedick is going to shotgun a beer. This all goes down in the basement cabaret at Union Hall (702 Union Street) in Park Slope, Brooklyn, at 3PM. It’s a great event at a great bar. (“That’s the idea.”) We hope to see you there! This entry was posted in Upcoming Events and tagged carbohydrates, hoyt jacobs, oh bernice, poetry, the hoyt jacobs poetry prize, the room, tommy wiseau, translation, union hall. Bookmark the permalink.